Langmuir film formation at the air/water (A/W) interface by silicones has attracted research interest for more than sixty years. 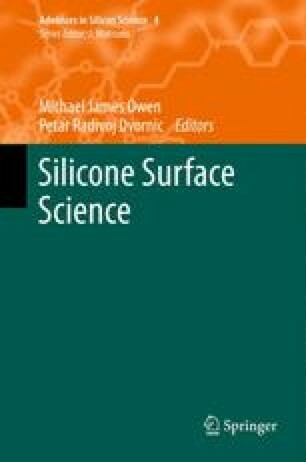 This chapter reviews the unique features of the surface pressure-area per repeat unit (Π-A) isotherm of polydimethylsiloxane (PDMS) and discusses the changes in surface viscoelastic properties determined by surface light scattering (SLS) associated with these features. The effects molar mass, end groups and non-methyl substituents have on the isotherm are also considered. This discussion is then extended to another class of surface-active silicon-containing materials, polyhedral oligomeric silsesquioxanes (POSSs). Trisilanolisobutyl-POSS and trisilanolcyclohexyl-POSS are discussed in terms of their Π-A isotherms and surface viscoelastic character and the review ends with a discussion of systems where POSS molecules are used as nanofillers within silicone monolayers. The authors are grateful for financial support from the National Science Foundation (CHE-0239633) and the Virginia Tech Aspires Program and to Michael Owen from Dow Corning for providing the gel permeation chromatography data. Linear samples of trimethylsilyl-terminated PDMS were obtained from United Chemical Technologies. Gel permeation chromatography results obtained from Dr. Michael J. Owen at Dow Corning Corporation revealed the polymers had number average molecular weights (M n ) and polydispersity indices (M w /M n ) of (M n ,M w /M n )=(1,210,1.46), (1,740,1.72), (3,370,1.55), and (10,400,2.47). Another linear sample with a viscosity of 5 cS corresponding to M n <1,210 failed to form a stable Langmuir film. A PDMS sample containing hydroxyl endgroups (M n =12,700, M w /M n =2.68) was obtained from Scientific Polymer Products, Inc. PDES, PMPS, and PMFS with nominal molecular weights of 30,000 2,600, and 4,600 were also obtained from United Chemical Technologies. All of the commercial polymers were used as received. HPLC grade chloroform or dichloromethane (Aldrich) was used to prepare spreading solutions with nominal concentrations of ∼0.1 g L−1 for Π-A isotherm and SLS studies on Millipore-Q2 (18.2 MΩ cm) filtered distilled water subphases. The spreading solvent had no influence on the experimental results. For the case of the PDES system, a 1:1 by volume mixture of chloroform and hexane also yielded identical results. A Teflon trough (28.5×11.0×1.25 cm) housed in a Plexiglas box to maintain high relative humidities (>70 %) was filled with Millipore water. The trough was cleaned before each experiment with a sulfuric acid/Nochromix (Godax Industries) mixture and was thoroughly rinsed with Millipore water. Temperature was maintained at 23.0 or 25.0 ∘C to ±0.1 ∘C by circulating thermostated water (Lauda, RM6) through a glass coil in the bottom of the trough. Surface tension was measured by the Wilhelmy plate technique with a Cahn 2000 Model electrobalance and a platinum plate (2.64×1.12×0.01 cm) that was cleaned by overnight storage in a 1:1 by volume mixture of concentrated sulfuric and nitric acid followed by extensive rinsing with Millipore water. This approach allows for the determination of surface tension to ±0.02 mN m−1. After filling the trough with water to the brim, a Teflon barrier was used to sweep the surface and concentrate any surface-active impurities on the non-monolayer side of the barrier. A clean glass pipet was then used to suction off the surface. This process was repeated a minimum of three times, or until the correct surface tension for water was obtained. The quality of the water was also verified by SLS prior to spreading a monolayer. The surface concentration, expressed in terms of area per repeat unit (monomer for short) was controlled by making successive additions of spreading solvent. After adding a desired volume of spreading solvent, at least 15 minutes was allowed for the spreading solvent to evaporate with the exact time determined by the point where dΠ/dt<0.04 mN m−1 over a 5 min period. All SLS and Π measurements were made simultaneously. The SLS instrument, see Sano et al. , incorporates the improvements of Hård and Neuman  and more recent descriptions of the instrument can be found elsewhere [31, 35]. The key feature for the SLS instrument is the use of a transmission diffraction grating  that allows for heterodyne detection of light scattered by spontaneously formed capillary waves that result from density fluctuations in the underlying subphase. For this study, fourth through seventh order diffraction spots were used to define the scattering angle. This range of diffraction orders corresponds to a spatial wave vector range of k∼250–450 cm−1. The wavelength of the laser (λ), incident angle (θ), and distance from the interface to the detector (R) were 632.8 nm, 64.4∘, and 3.64 m, respectively. Specific values of (dω/dk) i , Δu i , and k i were obtained from an iterative solution of Eqs. (7.19) and (7.7), along with expressions for ω [47, 48] and the temporal damping coefficient (α=πΔf s,c ) [37, 103] for pure liquids (Eqs. (7.6) and (7.7)). After calibrating with water, the validity of the calibration is tested with anisole and ethylbenzoate to ensure that Eqs. (7.6) and (7.7) yield σ d and η values that agree with the literature to 3 %. This approach for monolayer studies yields overall errors of 0.5 % and 5 % for f s and Δf s,c , respectively.